Electricity is something most of us take for granted, especially considering how most appliances and lights turn on and off with the flick of a switch. Every once in a while, though, repairs or upgrades are necessary. When that happens, you need quick access to a local electrician or team of electricians you can count on. At Granite State Electricians, we go out of our way to provide some of the best residential and commercial electrical service in the Manchester area. Whether you need a seasoned professional with expert troubleshooting skills or a master electrician to perform a service upgrade or rewire a building, we have the background and credentials to get the job done right. We're also happy to help you out with small electrical repairs for light switches, electrical outlets, and doorbell wiring. For a free quote or to schedule a convenient service call, contact us today! In addition to serving local homeowners and businesses in Manchester, we're also proud to include the following communities in our service area: Nashua, Salem, Auburn, Bedford, Derry, Merrimack, Litchfield, Amherst, and Windham. We go out of our way to provide you with the fastest and most reliable commercial and residential electrical service in town, and our workmanship always conforms to the highest standards of both quality and safety. When you need a certified electrician with years of practical experience, Granite State Electricians is always available to meet your routine and emergency electrical needs. Our decades of experience and longstanding commitment to fast service are two of the many ways we stand out from other local electricians in the area. When you choose Granite State Electricians for your wiring and electric installation projects, you can do so with complete confidence in our capabilities and customer service. Whether you need us to install recessed lighting, handle a service upgrade, or repair a light switch, you can always expect total professionalism and top-notch proficiency. We also look for ways to provide you with extra value, such as free estimates, emergency services, and waived service fees on completed electrical repairs. Find out how we can help protect you and your family from possible faulty wiring, unsafe surge protectors, and house lighting hazards. In addition to checking your home or business for electrical safety code issues, we're also available to install smoke alarms, carbon monoxide detectors, and GFCI protection devices. 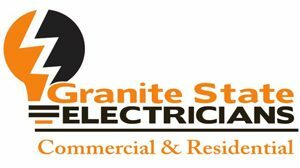 For exceptional residential and commercial electrical service in the Manchester area, contact us today at Granite State Electricians! Granite State Electricians is an entity of GSEP Services, LLC.